The International FA Board (Ifab) will discuss whether to bring the ban into place in the Premier League next month. They will also discuss replaced players leaving the pitch at the nearest boundary line instead of via the technical area. Crystal Palace manager, Roy Hodgson isn't so sure about it, "It is a complicated subject," said former England boss Hodgson. "Does it mean that the moment the 90 minutes is up, that you would have to play with 10 men if a player got injured? And for the guy who wants to waste time, who is going to actually decide whether the player is feigning injury or not?" he added. Hodgson said he didn't see how stoppage-time substitutions "served a purpose" and said "there are other areas" where time can be wasted. He also believes the only way to be sure of no time-wasting was to introduce a stopwatch "like they do in basketball" to time the length of game play. "The idea has been dismissed but that would be the only way of making sure the game was 100 per cent 90 minutes," said Hodgson. Any decision to change the laws is not expected when the Ifab annual meeting takes place in March. The average time the ball has been in play in Premier League matches this season is 55 minutes nine seconds. Burnley's 2-1 Premier League victory over Cardiff in September saw the ball in play for only 42 minutes two seconds, the lowest mark since the start of the 2017-18 season. During that time there have been 2,599 substitutions in the Premier League, with 129 (5%) taking place in the 90th minute or later in a match. 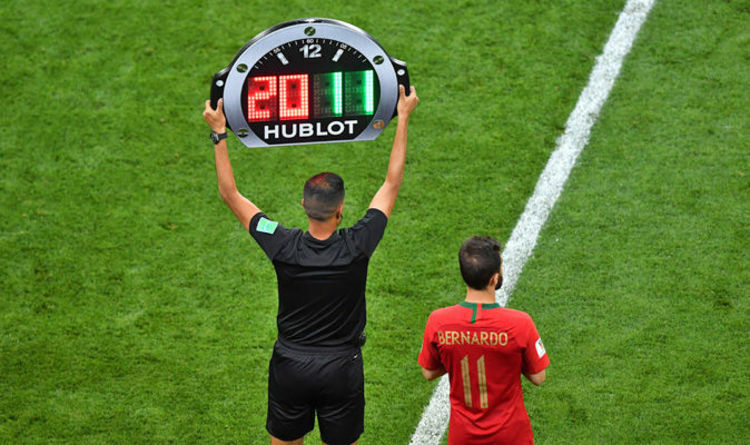 The average amount of second-half injury time since August 2017 is four minutes 22 seconds. Ifab will also discuss introducing yellow and red cards for team officials, which could progress to a decision to be included in the laws in 2019. The body is likely to look at allowing goalkeepers to be able to play the ball to a team-mate within the penalty area from a goal kick, with the attacking side not permitted to enter the area. This proposal is targeted at youth level football and will not go to vote next year.